House Speaker Nancy Pelosi (D-CA) is still refusing to come to the table to end the partial government shutdown. However, an activist found the perfect way to stick it to her. Accompanied by several alleged illegal immigrants, she jumped the wall surrounding Pelosi’s California mansion and demanded entry to the multi-million dollar home. You’ve got to see this. With the government shutdown currently in its fourth week, the American people have grown mighty fed up with Democratic leadership, which is doing absolutely nothing to work toward a compromise with President Donald Trump, who has demanded $5.7 billion in the budget to provide for a wall along the U.S.-Mexico border. 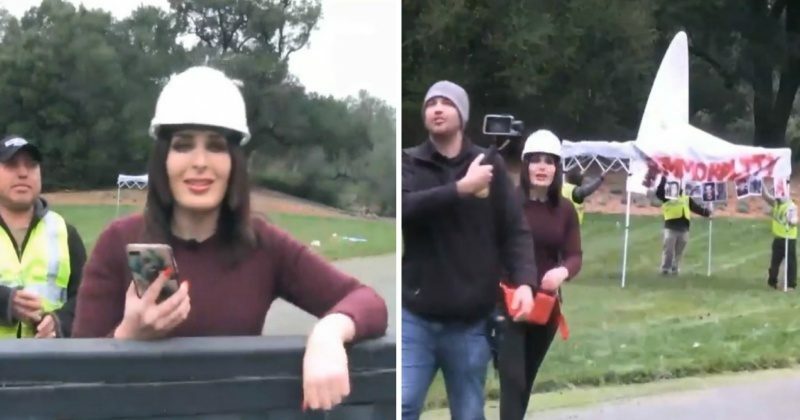 Enter Laura Loomer, the conservative activist who has been banned from the likes of Twitter and GoFundMe for her efforts. On Monday, Loomer jumped the wall surrounding House Speaker Nancy Pelosi’s mansion with several alleged illegal immigrants in tow, and she demanded entry to the California Democrat’s luxury home. During one part of the video, Loomer could be seen marching to the door of Pelosi’s mansion, demanding she be let in to make a “sandwich.” Loomer found the door to be locked and complained that it was “hypocritical” of Pelosi to not have “open doors and borders” to her own property, even as she stands in the way of securing the U.S.-Mexico border. Ultimately, authorities arrived on the scene, but Loomer’s stunt had already gone viral and the damage to Pelosi’s agenda had been done. The Democrats love to decry Trump’s plan for a border wall as “immoral,” but they’re the first to have walls built around their own homes for protection. Nancy Pelosi is the perfect example. Why should she get to enjoy such safety and security while hanging the American people out to dry? “The wall is immoral? Look at all of the countries that have walls. They work 100 percent. Never going to change. A wall is a wall,” he added. Indeed, if walls didn’t work, the Democrats wouldn’t have them around their own homes. If they want to let dangerous criminals and gang members into the United States, they ought to put their money where their mouths are and let unvetted immigrants into their homes. But I wouldn’t hold my breath waiting for them to do so if I were you.